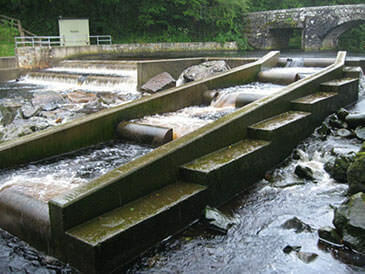 Renewables First has designed and built fish passes throughout the UK and the Republic of Ireland, most often in combination with hydropower installations but also as standalone fish passes. 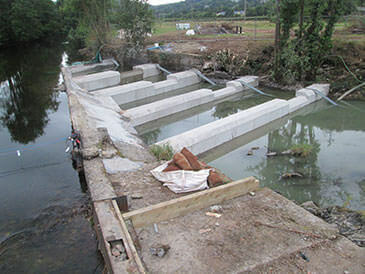 We are a one-stop-shop for delivering fish pass projects; we can do the design, obtain the appropriate consents from regulatory bodies and construct the fish pass as well, so the client has a single point of contact from start to finish. 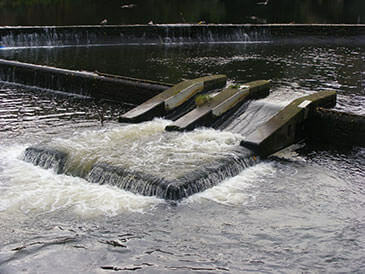 The most common fish pass design is a Larinier because it is multi-species and the width and baffle height can be adjusted (at the design stage) to suit a range of flow rates. 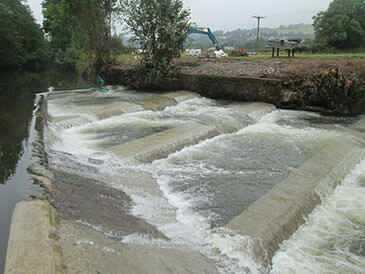 Depending on the height of the obstruction to overcome, rest pools can be incorporated between the fish pass flights to allow fish to ascend the obstruction in stages without becoming exhausted. It is also possible to design a Larinier fish pass to work as a canoe pass which meets . Two-module, twin-flight with rest pool Larinier fish / canoe pass. Alaskan ‘A’ fish passes are a type of Denil fish pass and are probably the second most common ‘modern’ fish pass type. 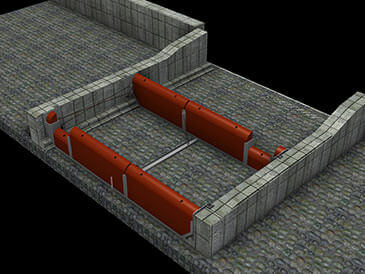 Alaskan fish passes have relatively compact dimensions which lend themselves to fabrication in steel or aluminium, which means the main fish pass can be fabricated off-site and then lifted into position to speed-up the construction phase. Alaskan fish passes work well for salmonid fish but are less effective for coarse fish, particularly as the fish pass gets longer and/or steeper. Steel fabricated baffles in concrete channel Alaskan ‘A’ fish pass. Temporary Alaskan ‘A’ fish pass installed to allow adjacent construction of a new Larinier fish pass and 400 kW Archimedean screw hydro system. Pool & Weir / Pool & Traverse fish passes in one form or another have been around for many years and are effective for salmonid fish but less effective for other species. New fish passes tend to use a multi-species Larinier design, but in some applications, particularly where space is tight, a Pool & Weir fish pass can be a good choice. We have also been involved in improving and repairing existing Pool & Weir fish passes. Improved design which is now installed and operational. Most new fish pass designs would be one of the types above, but there are many other fish pass designs including some ‘non-technical’ fish pass designs such as Rock Ramp fish passes. Although not as experienced with these designs our knowledge of the more common fish pass types would mean that we could also design or work on the less-common designs if required. Some fish passes require integrated fish counters, either for temporary validation that a new fish pass works or long-term monitoring. We have integrated a number for fish counter types into fish passes including resistivity counters and the Vaki Riverwatch system. When required we work with specialists fisheries consultancies to provide an initial fisheries impact study to determine the optimum overall strategy for a site to improve fish and eel passage. 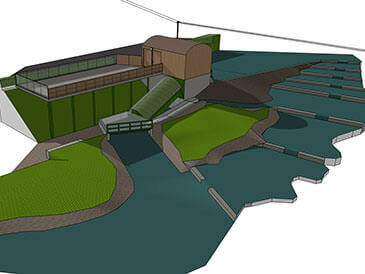 So, if you are looking for a new or refurbishment fish pass design with or without the construction services, please get in touch with Renewables First using the enquiry page and select ‘Fish and eel pass design’ as the enquiry type.